It dawned on me today that it has been three months since I wrote a post on FireupWaterdown, my blog that explores the elements across the globe. Where has the time gone! Over that period I have written some posts on my ‘sister’ blog ‘Elemental Japan’ (elementaljapan.com), which I’d recommend visiting. Whether or not you have a specific interest in the elements in Japan, I like to think that you will find something to captivate you. Elsewhere in the world there are many elemental topics and events to catch up on. Like the upcoming extreme ice marathon in Siberia in January 2017. It builds perfectly on my most recent post ‘The cool dude on the bike‘. 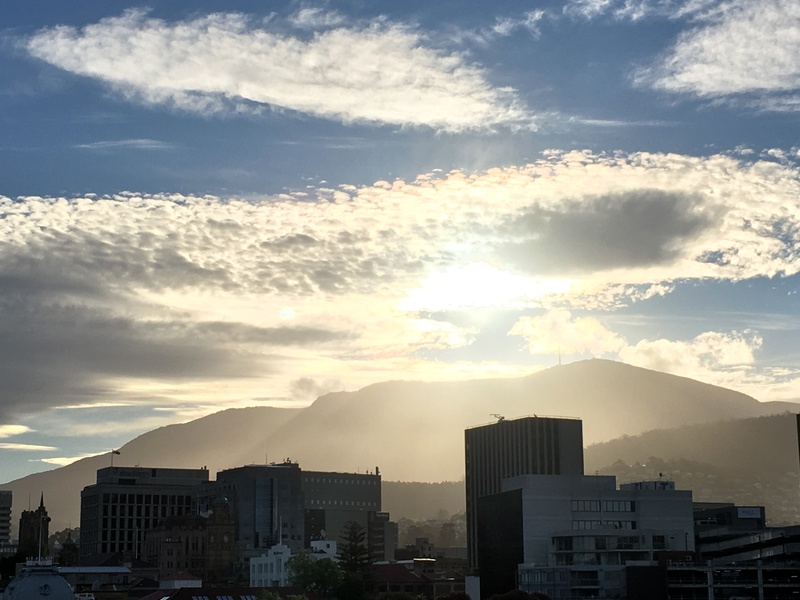 Then there was the spectacular sunrise over Hobart this morning and the sunset over kunanyi/Mt Wellington the other night. What glorious reminders of the elemental nature of our lives. Plus I’ve come across some stimulating ideas about representing and connecting with the elements through art. And that’s just the tip of the iceberg, so to speak. The sun setting over kunanyi/Mt Wellington the other night set the mountain aglow. The moods of the mountain are ever changing as it watches over the city. 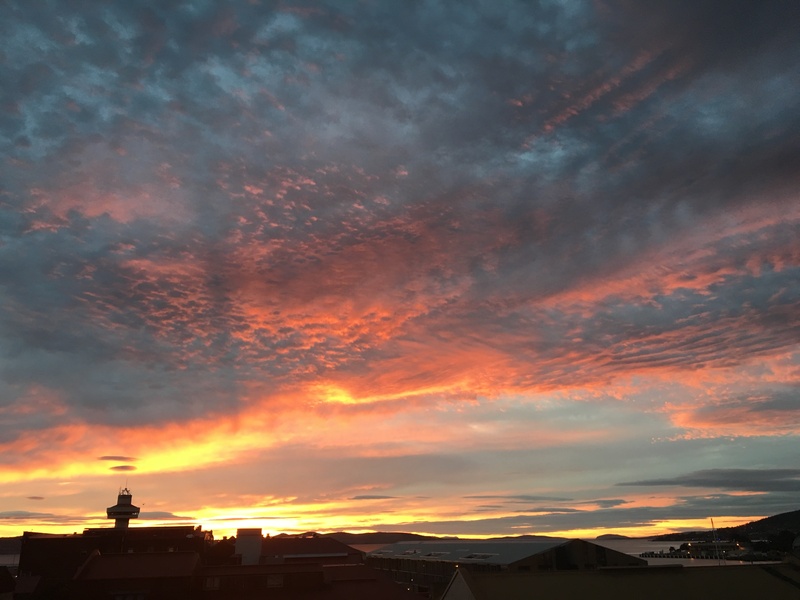 Sunrise this morning in Hobart. All I could say was wow! Such an awe-inspiring and energetic start to the day. Fire, water and air interacting with the earth to create this incredible spectacle. We are heading into summer and the fire season in Tasmania. February 7, 2017 marks 50 years since Hobart was devastated by a major fire. In contrast it will be very cold on January 7 next year when the International Siberian Ice marathon is held. My friend Claude Fisicaro has made a video about the marathon and it looks exhilarating, and a little crazy! It is held in Omsk each year on the day of the Russian Orthodox Christmas. Once we work out how to link the video to this post I’ll share it with you. As well as the marathon there are some impressive ice sculptures to admire, sleds pulled by Huskies to ride and much more. The half marathon and associated events are, as the video says, ICE COLD FUN! Attitude plays a big role in how we cope with extreme elements, as this marathon attests. This point was also made by the author of ‘Frostbikes’, the book I featured in the blog ‘The cool dude on the bike‘. 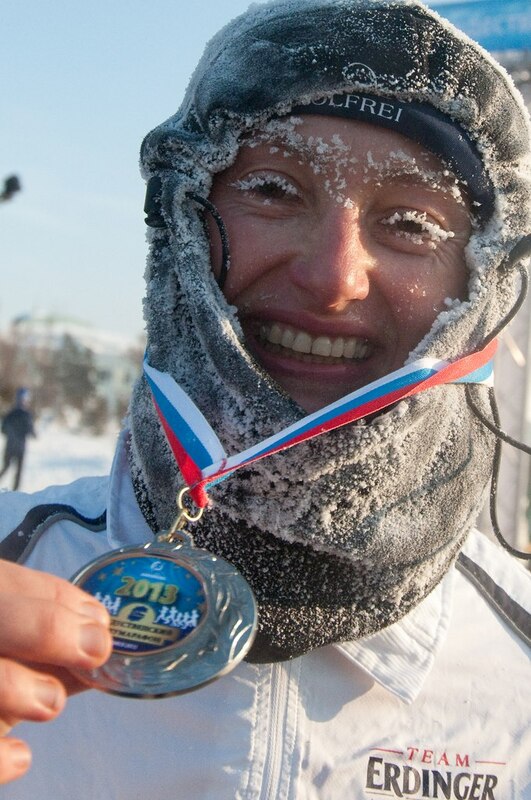 A joyous image of a runner in the 2013 Siberian Ice marathon from http://www.runsim.au. While many people take shelter and slow down during cold periods, these runners embrace the icy elements. Some even immerse themselves in freezing water after the race. They are really cool dudes! 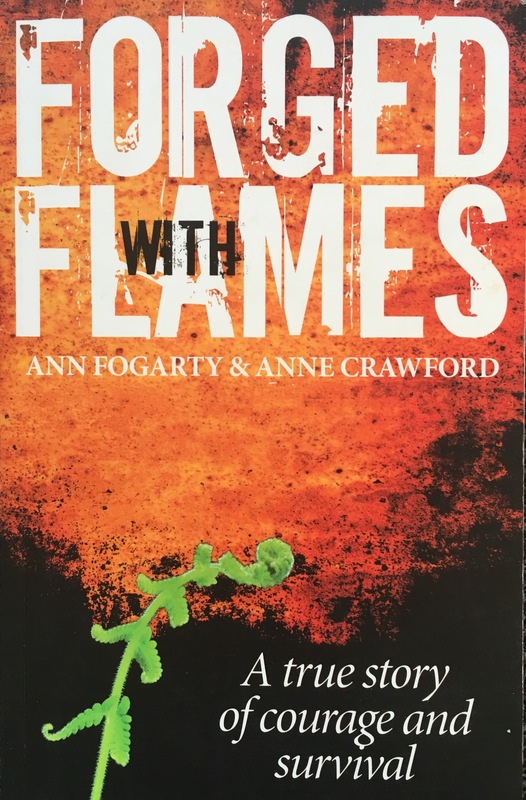 From ice to fire, this recently discovered book adds to my collection of stories about how people respond to and recover after major wildfires. This one stems from the ‘Ash Wednesday’ bushfires that occurred in Victoria, Australia in 1983. As we get closer to the 50 year anniversary of the 1967 fires in Hobart I will feature the experiences and lessons that these very personal and inspirational stories tell us. With fire frequencies and intensities increasing around the globe, these types of books are likely to grow. Three months is quite a long time and my collection of books on the elements continues to grow. These two are children’s books. I love the expression on both the main characters, although George’s would be Number 1 if I had to choose between them. Excitement and danger, an apt description of the experiences that natural forces can create. 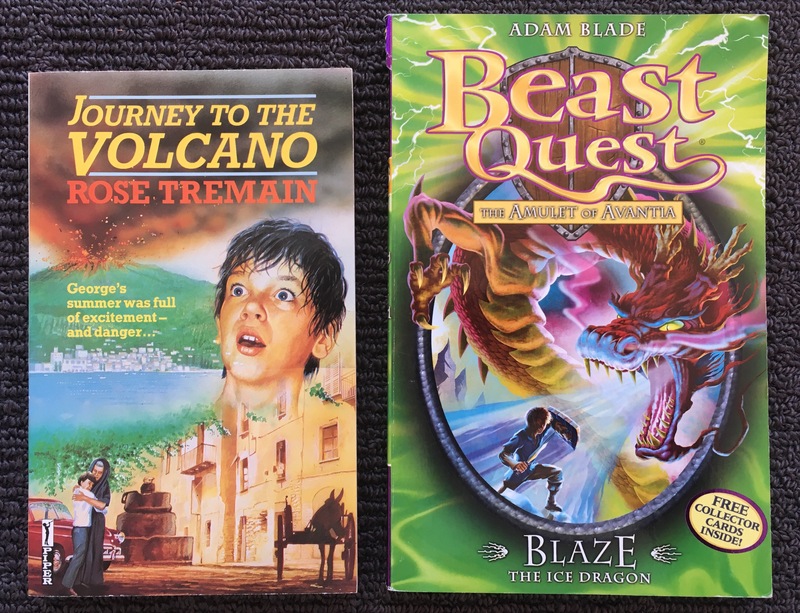 My recent discovery of the ‘Beast Quest’ series opened my eyes to a new world full of beasts that rule the elements and that appears to be very popular. My concern that I was accumulating too many books was quelled when my friend Courtney posted a meme on Facebook from Doctor Who and the T.A.R.D.I.S. It asks the question “Too many books?” to which the answer is “I think what you mean is “not enough bookshelves.”” That made me feel better. 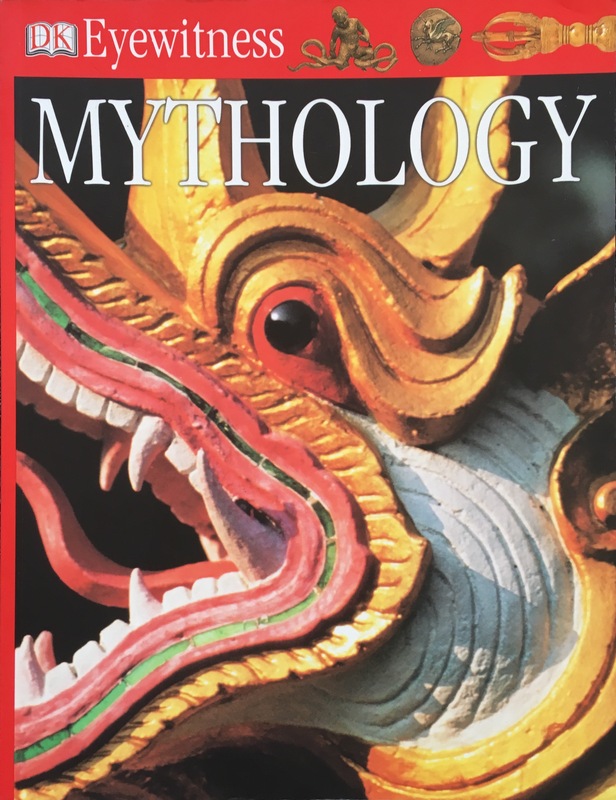 Another book I was pleased to find was this one on mythology which has a two page spread titled ‘The elements.’ Way to go! It makes the point, as readers of this blog are well aware, the all over the world the elemental forces that form it have been the focus of myth-making. It’s describes the Western tradition as four elements (see my blog on the fifth element as a counterpoint) and the Chinese tradition as five elements. Somehow the five elements of Buddhist and Hindu traditions get overlooked. As shown below, the other examples describes myths associated with individual elements across different cultures. While the coverage is not comprehensive, it is a good start. The important point is to highlight the ubiquity of the elements in myths and stories across the globe. 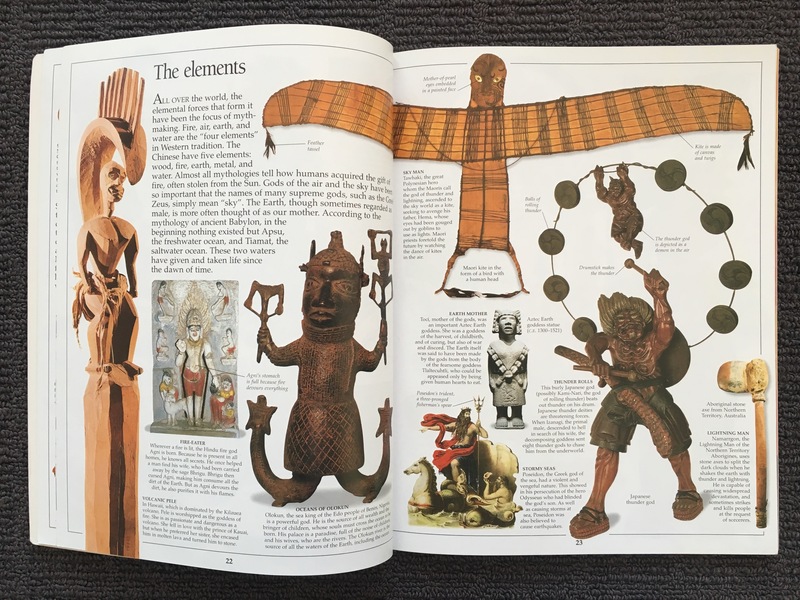 The two page spread on ‘The elements’ in the Eyewitness book on mythology described above. There is also a separate entry on floods and storms. Because I’ve recently spent a month in Japan it would be remiss of me not to have at least one reference to the elements in this country. 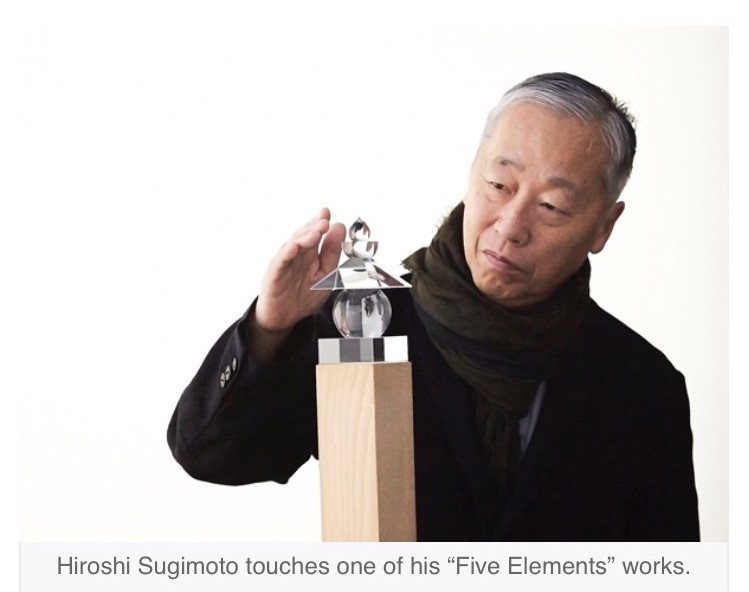 This crystal pagoda, created by Hiroshi Sugimoto in 2009, represents (from bottom to top) the five elements of earth, water, fire, wind and void. I was fortunate to see it as part of the installation ‘Coffin of Light’ at Benesse Park on Naoshima island in Japan. While I have already used the image in my post ‘Elements on tour‘ (at elementaljapan.com) it is striking enough to include again. It is a strong and captivating work of art with many dimensions. The story of the ‘Crystal Pagoda’ continues in the main text. Since writing the earlier post I have learnt that the black line in the middle of the round ‘water’ element in the five element pagoda represents the horizon of the sea. This is a motif Sugimoto has photographed around the world and is especially apt here. This calm seascape is reminiscent of the newborn earth according to Sugimoto. This Buddhist reliquary is integral to his thesis that history may be ever-changing, but History as the form we use to contain and crystallise this challenging world, is always aesthetic. Sugimoto says that he feels a calming sense of security every time he sees the sea. He describes it as a mystery of mysteries with water and air right there before us in the sea. Sugimoto’s art captures the ephemeral nature of the elements in a permanent form. The preceding commentary is adapted from an article in ZQED Arts on Sugimoto’s exhibition ‘History of History’ held in California in 2007 and from http://www.sugimotohiroshi.com. That’s apart from the last sentence about ephemera, which is mine. This image from mengnews.joins.com gives an idea of the size of the five element pagoda. 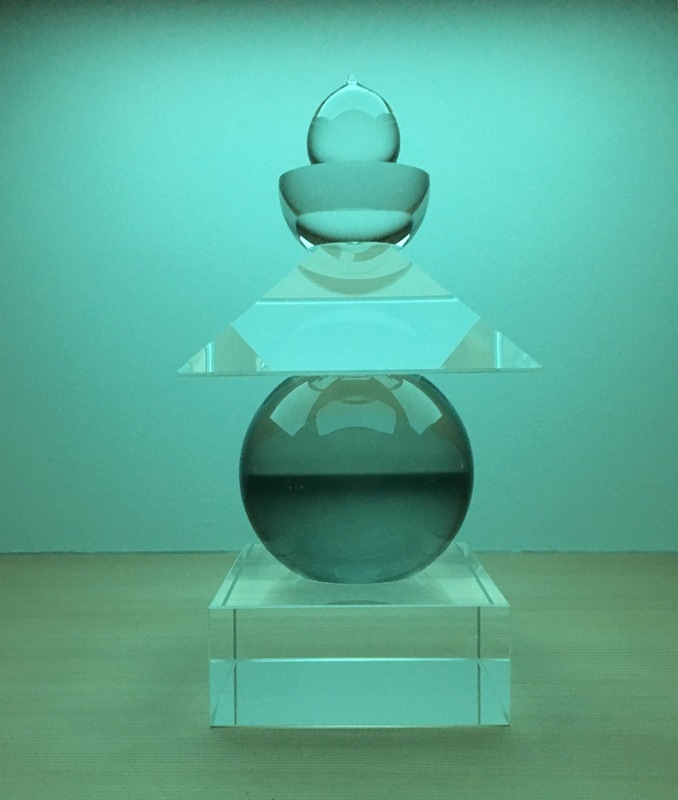 This example was in an exhibition held in the Samsung Museum of Art in Seoul in 2013. There are of course many other events related to the elements that have occurred or I have discovered over the last three months. They will be picked up in future posts. I would like to conclude this brief update with a collaboration between two artists and a musician and encourage others to follow in their footsteps. One final addition to this catch up on the elements is this book and CD I came across recently, called ‘The Floating Islands’. I really like the idea of incorporating music to add an extra dimension to the tale being told. 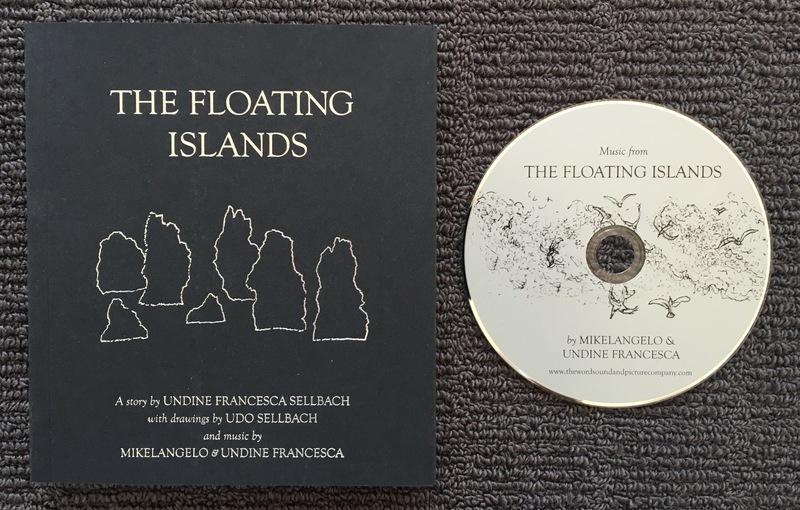 The music in this case, composed by Mikelangelo, is a perfect accompaniment to a story about floating volcanic islands where fantastical creatures live. Multi-media productions are very suited to the elements. This entry was posted in Australia, Books & reviews, China, Earth, Fire, India, Japan, Performing arts, Popular culture, Story telling, The five elements, USA, Visual Arts and tagged Air, Buddhism, China, earth, ether, Fire, Japan, Quintessence, Sugimoto, the elements, Water. Bookmark the permalink. One thing is clear, you will never run out of elemental ‘content’! I imagine you plucking all of these elementally connected stories and events out of the air, or should I say, the ether! 😊 It was definitely worth reading the article about the works on the natural world by the group of digital artists, it’s inspiring. And good to see Claude’s marathon receive a mention. Cool dudes, for sure. Once you are attuned to them, the elements are everywhere, physically and culturally. So there will always be stories to share. There are so many inspirational, creative, bold people in the world who embrace the elements. They fill me with wonder and give me hope.